WERE it not for the graffiti on abandoned buildings, Bitterfeld-Wolfen, two towns north of Leipzig joined as one in 2007, would seem devoid of young people. Pharmacies, physiotherapy surgeries and shops selling garden gnomes line the sleepy streets. In its heyday the place had a booming chemical industry. Today “the air is much cleaner and we can finally hang out laundry”, says an elderly local out on a morning stroll. “But many jobs were lost and so few children are left.” He points out a building that was once a school; today it is one of many care homes. Despite an influx of 1.2m refugees over the past two years, Germany’s population faces near-irreversible decline. According to predictions from the UN in 2015, two in five Germans will be over 60 by 2050 and Europe’s oldest country will have shrunk to 75m from 82m. Since the 1970s, more Germans have been dying than are born. Fewer births and longer lives are a problem for most rich countries. But the consequences are more acute for Germany, where birth rates are lower than in Britain and France. If Germany is a warning for others, its eastern part is a warning for its west. If it were still a country, East Germany would be the oldest in the world. Nearly 30 years after unification the region still suffers the aftershock from the fall of the Berlin Wall in 1989, when millions—mostly young, mostly women—fled for the west. Those who remained had record-low birth rates. “Kids not born in the ’90s, also didn’t have kids in the 2010s. It’s the echo of the echo,” says Frank Swiaczny from the Federal Institute for Population Research, a think-tank in Wiesbaden. The east’s population will shrink from 12.5m in 2016 to 8.7m by 2060, according to government statistics. Saxony-Anhalt, the state to which Bitterfeld-Wolfen belongs, is ahead of the curve. Berlin used to pay little attention to the area. But regional decline has already had a political effect. In a state election in March 2016, a populist party, the AFD, came first in Bitterfeld and second in Wolfen. Such places will matter in a federal election in September, which is expected to be tight. Bitterfeld-Wolfen has seen its population plummet from 75,000 in 1989 to 40,500 today. Even after administrators tore down blocks of flats, and cut floors off others, skeletal remains of buildings still await the wrecking ball. Nearly one building in five is empty. A grand Stalinist-era construction, once the town’s cultural palace, now stands deserted. Two-thirds of kindergartens and over half the schools have closed since 1990. The number of pupils finishing secondary school has fallen by half. Employers struggle to fill vacancies. Apprentices—especially in service industries—are hard to find. The one booming industry, care, is desperate for more geriatricians, nurses and trainees. To help fill the gap, the local Euro-Schulen, a training institute, has turned to Vietnam. Having studied German in Hanoi, 16 young apprentices started this month, with 20 scheduled to follow soon. Nearby Dessau is setting up a similar arrangement with China. Germany has long relied on migrants to make up for low fertility rates. Unusually high migration in recent years has more than offset the shrinkage of the native-born population. But the EU countries that have traditionally provided the migrants, such as Poland, are also ageing. Migrant flows will slow; competition for labour will increase. And Olga Pötzsch, from the Federal Statistical Office, argues that Germany will need far more migrants to stop population decline, which is predicted to accelerate from 2020. Uwe Schulze, a senior local official, says that refugees are not filling the labour shortage. Of the 2,600-odd asylum-seekers who arrived in the district in 2015 and 2016, fewer than a third are now registered as “capable of working” and only 40 are fully employed. From his wood-panelled office in a neoclassical building that once housed one of Europe’s largest colour-film makers, Armin Schenk, Bitterfeld-Wolfen’s mayor, says the problems are mostly to do with language, qualifications and uncertainty about asylum. Asked whether Afghans and Syrians could join the same programme as the Vietnamese, Liane Michaelis, from Euro-Schulen, forcefully shakes her head, citing educational, religious and ethical barriers for care jobs. 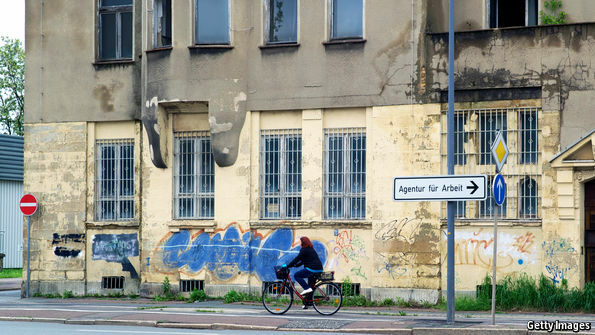 She adds that “Those who do have the right papers leave quickly.” According to the OECD, about half of asylum-seekers who started in eastern Germany in the past moved to places such as Hamburg once they secured their permit. With the odds seemingly stacked against it, Bitterfeld-Wolfen is at least trying. On a whirlwind tour of the town, Mr Schenk shows how the old coal mine was turned into a lake with a new marina and a promenade. He repeats the town’s main hope: “It’s all about offering good-quality life and leisure.” A brochure shows pictures of smiling children, yachts and tennis. Bitterfeld-Wolfen, it reads, is “one of the youngest cities in Germany”. But even if such marketing did stem departures (and in 2015, for the first time, inward migration slightly exceeded the outflow) it is still shrinking; more than twice as many die each year as are born. Across many parts of rural Europe mayors struggle with similar problems, wondering when to turn their school into a care home. By 2050 Greece, Italy, Poland, Portugal and Spain—which, unlike Germany, have all suffered net brain-drains—will be older than Germany by median age and will have shrunk substantially, according to the UN. Ageing and emigration are likely further to dampen growth in central and southern European countries, says the IMF. It calculates that by 2030 GDP per person in several countries, may be 3-4% lower than it would have been without emigration. In Germany, however, the consequences are particularly acute. With a strong economy and a tight labour market, some employers already struggle to fill vacancies. BCG, a consultancy, predicts that by 2030 the country will be short of between 5m and 7m workers. The triple shock of a smaller workforce, increased social spending and the likely dampening effect of an older workforce on innovation and productivity will drag down future growth, predicts Oliver Holtemöller from the Leipzig Institute for Economic Research. These effects are stronger in the east, he adds. Productivity is 20% lower than in the west; the ageing population and continuing migration to the west will make economic convergence even less likely. Given such inflammatory rhetoric, many people understandably felt considerable trepidation in the run-up to Trump’s summit with Chinese President Xi Jinping at Trump’s Mar-a-Lago estate. It wasn’t hard to imagine a refused handshake or the presentation of a bill for payment, like the one Trump reportedly gave visiting German Chancellor Angela Merkel (a report denied by the White House). Instead, Trump treated Xi with considerable deference. One explanation is that he was preoccupied by the impending US missile strike on Syria. Another is that it is easier to command Trump’s respect when you have an aircraft carrier, 3,000 military planes, and 1.6 million ground troops. But the best explanation is surely that the US depends too heavily on China, economically and politically, for even a president as diplomatically reckless as Trump to spark a conflict. Economically, the US and China are too closely interlinked through global supply chains to be able to cut ties. US companies not only compete with Chinese imports; they also rely heavily on them. Retailers like Target and Walmart rely on Chinese imports to stock their shelves. Electronics companies like Apple rely on workers in China to assemble their products. And the idea that the US could easily source the same inputs from other countries is fanciful. Put simply, while Trump has repeatedly observed that China sells more to the US than the US sells to China, starting a trade war in an effort to correct this supposed imbalance would still cost American business very dearly. And if there is one constituency that Trump listens to consistently, it is business. Aggressive US trade sanctions against China would send equity prices plunging, alarming a US president who measures his economic policy success by the level of the stock market. The 1930 Smoot-Hawley Tariff didn’t cause the Great Crash, much less the Great Depression. But that tariff and the foreign retaliation it elicited sent the stock market down still further, which was hardly helpful. Politically, too, the US cannot afford serious conflict with China, given the growing crisis on the Korean Peninsula, which North Korean provocations and Trump’s incautious reaction have brought to the fore. Posturing aside, Trump will be forced to recognize that military force is not an option. A surgical strike against North Korea’s nuclear facilities would most likely not succeed, while a massive attack would provoke devastating retaliation against South Korea. The only feasible strategy is tighter sanctions and political pressure to bring North Korea to the negotiating table. And the only party capable of tightening sanctions and applying effective political pressure is China, whose goodwill the US now regards as essential. Trump’s about-face on China is of a piece with his “recalibration” on repealing Obamacare, reforming the tax code, organizing a large-scale infrastructure-investment initiative, and renegotiating the North American Free Trade Agreement (NAFTA). In each case, his glib campaign slogans have run up against the hard reality of actually making policy. In all of these areas, Trump is learning that he is hemmed in by the same constraints that led Barack Obama’s administration to make the choices it did. As with Obama, the agent of change is turning out to be an agent of continuity. The US has some legitimate economic grievances against China – for example, over its treatment of American intellectual property and US beef and grain exports. But the appropriate venue for adjudicating such disputes is the World Trade Organization. That is where Trump’s administration, like Obama’s, is likely to end up. The Trump administration could yet label China a currency manipulator, rebuking it for keeping its exchange rate artificially low. It could do so either now or later in the year. But that accusation would be contrary to the facts: the renminbi is now fairly valued, and China has actually been intervening to support the exchange rate, not weaken it further. Inside the Washington, DC beltway, however, facts are no longer what they once were. Singling out China for manipulation might still appeal to a president who values symbolism as much as Trump does. But little of consequence would follow. The US depends too much on Chinese cooperation to risk overly antagonizing China’s leaders. Labeling China a currency manipulator would be the economic-policy equivalent of launching 59 cruise missiles at an isolated air base in Syria. It would be much sound and fury, signifying nothing. 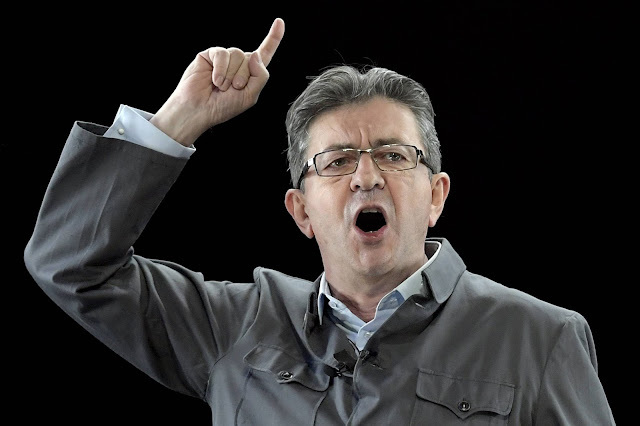 FENAIN, France—Far-left firebrand Jean-Luc Mélenchon, campaigning as an antiglobalist champion of a forgotten working class, has surged into contention in France’s presidential election, transforming the contest into a four-way race. Strong performances in TV debates and an ability to draw massive crowds with his promises of higher wages and fewer working hours has propelled Mr. Mélenchon into third place in some polls, ahead of conservative François Fillon and within striking distance of National Front leader Marine Le Pen and upstart centrist candidate Emmanuel Macron. “He brings something new, new ideas, compared to the candidates we’ve had for a number of years,” said Bruno Bastin, a 25-year-old working in his family’s funeral parlor in Fenain, a town in France’s deindustrialized north where Mr. Mélenchon is hunting for votes. The surge in support for Mr. Mélenchon, who dons a Mao jacket on the campaign trail, is scrambling the math of an already erratic French presidential election campaign that has sidelined traditional political parties. The changing landscape has spooked investors. On Tuesday, the extra yield investors demand to hold 10-year French government debt over safe-haven German bonds rose to nearly 0.75 percentage point, nearing a 2017 high reached in mid-February, as they fled French assets. 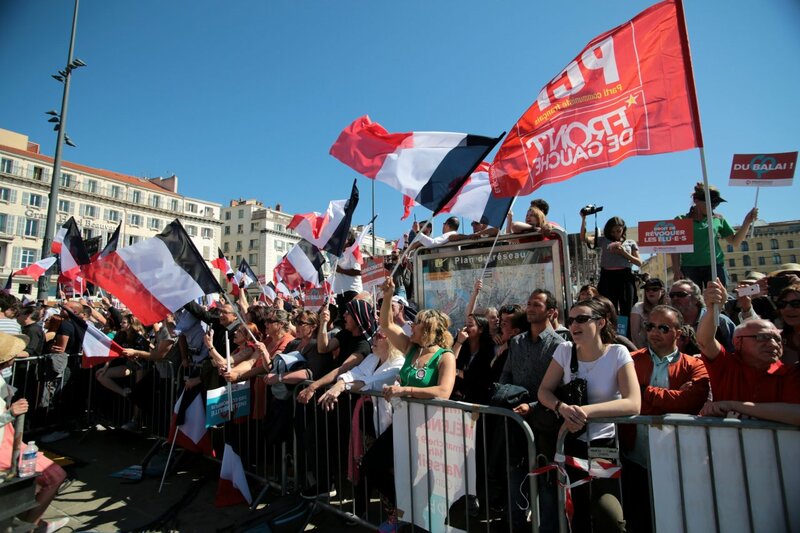 At a rally in Marseille on Sunday, Mr. Mélenchon told a crowd of about 70,000 that his rising popularity means he might advance beyond the April 23 first-round vote to the decisive runoff on May 7. “You can hear it. You can feel it. Victory is within reach of our efforts,” Mr. Mélenchon said. A nationally representative poll by Kantar Sofres-Onepoint published Sunday showed Mr. Mélenchon on 18%, overtaking Mr. Fillon on 17% and only six points behind Ms. Le Pen and Mr. Macron. The previous comparable poll in mid-March had Mr. Mélenchon at only 12%. Benoît Hamon, candidate of the ruling Socialist Party, has fallen so far out of contention that over the weekend he said he would vote for Mr. Mélenchon in the second round of the election. In a runoff against Ms. Le Pen, Mr. Mélenchon would win with 57% of the vote, the Kantar Sofres-Onepoint survey projected. “Given Mélenchon’s momentum he could well become the biggest surprise of this volatile election,” said Antonio Barroso, an analyst at political-risk consultancy Teneo Intelligence. Mr. Mélenchon is seeking to build momentum at his next major rally Wednesday in Lille, the northern bastion of the French left 25 miles north of Fenain. His message of restricting layoffs and handing power from shareholders to workers is expected to resonate in an area suffering from plant closures and deindustrialization. Mr. Mélenchon already ran for president in 2012 after quitting the Socialist Party in 2008. Polls at the time also showed a surge in the closing weeks of the campaign, although he scored only 11% in the actual vote. This time, the far-leftist who rails against austerity and the European Union has led a more innovative election campaign, using a hologram of himself in February to stage a rally simultaneously in Paris and Lyon. He plans to repeat the stunt in seven locations at once for one of his final rallies before the first round of voting. The plan is aimed at bringing back voters who had written him off. Thibault Ducrot, an unemployed 31-year-old from Lyon, said he planned to vote for the centrist Mr. Macron for practical purposes, despite his natural inclination to vote for Mr. Mélenchon. But now, “if he has a chance to get through, I’d think about it,” Mr. Ducrot said. Mr. Mélenchon is running on a similar soak-the-rich program as five years ago. He has pledged to raise taxes on inheritance and capital, outlaw stock-options and create a maximum wage by taxing all income over the level of €400,000 ($423,000) a year. For workers, Mr. Mélenchon says he would grant a sixth week of annual vacation, encourage a four-day, 32-hour workweek, raise the minimum wage and reduce the retirement age. He would also abolish the labor law socialist President François Hollande introduced last year that gives more power to companies to negotiate conditions with workers. Mr. Mélenchon wants to pull France from the North Atlantic Treaty Organization and radically overhaul Europe—points that overlap with the anti-Europe platform of Ms. Le Pen. Mr. Mélenchon says he would devalue the euro, restructure public debts, increase protectionism and authorize the European Central Bank to lend directly to states. If he doesn’t achieve those aims in negotiations, Mr. Mélenchon says he would implement a “Plan B” to pull France out of the euro, impose capital controls and stop contributing to the EU budget. But even as he spoke, the situation was changing. Mr. Ben Nasr’s vote for Mr. Mélenchon no longer looks like a first-round footnote. “He’s the one who tells the truth,” Mr. Ben Nasr said. Rising interest payments are already showing up in the federal fisc. President Obama left his successor many time bombs—think chemical weapons in Syria and the collapsing Affordable Care Act. But a burning fuse that gets less attention showed its first signs of the explosion to come in Friday’s Congressional Budget Office budget review for March: Rising net interest payments on the national debt. CBO reported that the federal budget deficit rose $63 billion in the first half of fiscal 2017 (October-March) to $522 billion from a year earlier. But here’s the especially bad omen: Net interest payments rose $7 billion, or 30%, in March from a year earlier. If that seems small, consider that interest payments rose $28 billion for the six months of fiscal 2017 to $152 billion. That’s a 22.2% increase, among the biggest in any single spending item highlighted by CBO. 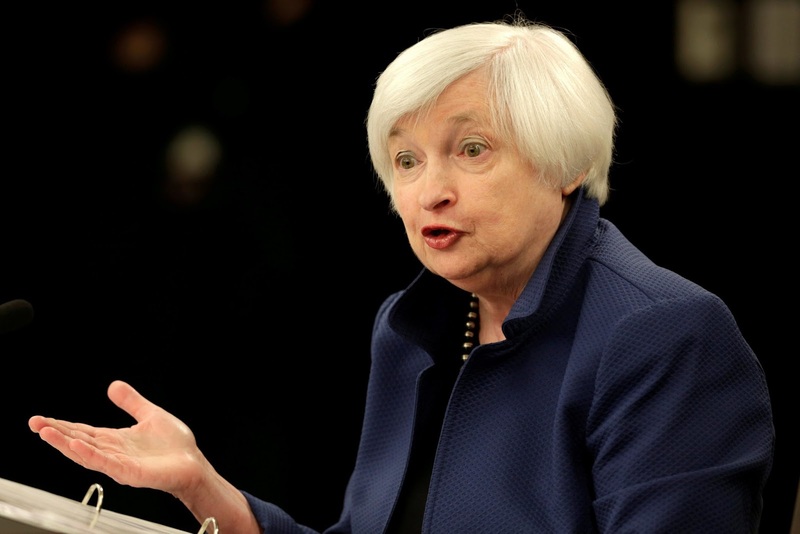 The increases reflect the growing debt but in particular the Federal Reserve’s decision to raise interest rates after years of near-zero rates. While Mr. Obama was doubling the national debt over eight years, the Fed’s monetary policies spared him from the fiscal consequences. The Fed’s near-zero policy kept interest rates at historic lows that reduced net interest payments even as the overall debt increased. The Fed’s bond-buying programs also earned money that the Fed turned over to Treasury each year, reducing the size of the federal budget deficit by tens of billions of dollars. This not-so-free Fed lunch is starting to end. CBO estimates that $160 billion more spending will be required each year over the next decade if interest rates are merely one percentage point higher than in its current projections. As interest rates rise, the Fed will also have to pay banks more to keep excess reserves parked at the central bank. After its latest rate increase in March, the Fed now pays banks 1% on reserve balances or about $20 billion a year, and that will go up. All of this is set to explode on President Trump’s watch, and it will complicate the task for Republicans as they try to reform the tax code within tighter budget constraints. Mr. Obama didn’t expect a Republican to succeed him but we doubt he regrets this result. He was able to live off the eight years of accommodative Fed policy while seeding the federal fisc with ever-higher spending from interest payments and the Affordable Care Act after he leaves office. Mr. Trump is stuck with the bar tab. It’s one more mess Mr. Obama left others to clean up. United Airlines found itself at the center of social media controversy this week, after a horrifying video of a doctor being forcibly removed from a coach class seat on one of its planes went viral. The man was, according to published reports, randomly selected to be bumped because the airline needed to transport four employees on the sold out flight. The doctor refused to leave, airline officials called law enforcement, and security dragged him, bloodied, off the plane. So what’s this got to do with United? Well, most of us don’t encounter the government on a daily basis. We do, however, live life as consumers. And our treatment is both increasingly disrespectful and reflective of our society’s growing income divide. In 2017, it often seems that the customer is the least important part of the transaction — unless he or she is paying top, top dollar. Take medical care. While the wealthy can turn to the growing practice of concierge medicine, where for a fee of over a thousand dollars annually, their personal doctor will always return their calls promptly, the rest of us are ever more likely to be relegated to a narrow insurance network. This great economic sort is on blatant display when we fly. 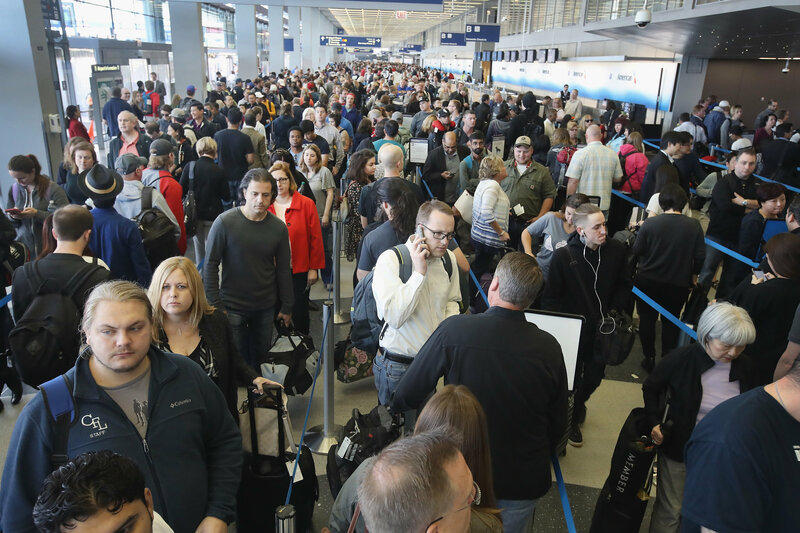 The airlines are seemingly forever coming up with new and innovative ways to coddle an increasingly small group, while treating the majority of fliers with greater and greater contempt. United Airlines is all too typical. The airline recently debuted fold out beds for business travelers, complete with mood lighting, adjustable lumbar supports and bedding from Saks Fifth Avenue. But United’s coach class travelers are subjected to constant nickel and diming. Extra legroom is now an extra charge. So too, for travelers in the airline’s new “Basic Economy” fare class, is the ability to choose one’s seat when booking a flight or the ability to bring more than one small, personal tote or bag on the plane. United’s initial apology for this most recent offense simply bolsters the case they are less than concerned with rank-and-file customers. The company — which reported $2.3 billion in net income last year — isn’t exactly issuing a heartfelt mea culpa. A spokesman told The New York Times, “we had asked several times, politely” for the man to leave his seat, as if that justified subsequent events. In a statement, Oscar Munoz, United’s chief executive officer, said he was sorry for “having to reaccommodate” the passenger and that the airline was working with authorities to find out what happened, but did not admit that allowing officers to physically manhandle a customer who was simply sitting in a coach seat hoping to get to his destination was, you know, wrong. A subsequent statement, issued on Tuesday, offered a much more full-throated apology. The same dynamic plays out in our political lives. In a study published in 2014, Martin Gilens at Princeton University and Benjamin Page at Northwestern University found government policy and actions rarely reflected majority sentiment, but instead favored corporate interests and the wealthiest Americans. When congressional Republicans offered up a health insurance reform package earlier this year that would have covered fewer people than the Affordable Care Act, Representative Jason Chaffetz, Republican of Utah, initially defended it by claiming Americans needed to choose between spending on necessary medical care or buying an iPhone. Meantime, the fabled 1 percent would have received an average tax cut totaling $37,000 if the legislation were fully enacted. Don’t mistake me. There are a lot of other things you can take away from this sorry event. There is the increased militarization of American life, with authorities reacting to common disputes in increasingly aggressive ways. There is a positive lesson, too, in that ordinary Americans have access to more potential publicity — and, hopefully, recourse — than ever before, courtesy of social media. Finally, there is a narrative of privilege at play. More than a few pointed out this contretemps would likely not have received as much attention if the unwilling passenger were poor or African-American. Others noted that the doctor, who is Asian-American, might have been treated differently by officers or airline staff if he were white. But this isn’t an either-or situation. Yes, we can tell people who perceive themselves as privileged to get used to the second-class treatment those poorer than them have been receiving for a long time. But it seems like a better bet, both ethically and for the sake of our futures, to improve conditions for all.